An excited group of students gets hands-on during a ragged-tooth shark dissection, presented by the KwaZulu-Natal Sharks Board in Durban, South Africa. In an effort to bring science to learners and visitors, the Sharks Board offers public dissections in hopes of inspiring curiosity and respect for these top predators for generations to come. It was amazing to witness the awe and intrigue of these young students as they replaced their fear of sharks with knowledge. The animal, which had died earlier that week, was dissected from snout to caudal fin, and each child was given the opportunity to look, smell and touch along the way. Each cut revealed a new, beautiful piece of the shark’s anatomy, and with it, information about the animal that will benefit research and shark conservation. A close look at the snout reveals the ampullae of Lorenzini, small vesicles and pores that form an extensive sensory network that allows sharks to pick up weak magnetic fields produced by other fish. The ampullary pores are lined with an electrically conductive jelly and hair-like cells called cilia. Electrical currents travel through the jelly to the cilia, allowing the shark to locate potential prey. What you're seeing here is the complex system of jelly-filled canals inside the shark's snout that help with electrosensory and olfactory function. Unlike in humans, shark nostrils have nothing to do with breathing and are not connected to the mouth. Instead of air, water continually flows through the nostrils and into the complex structure inside the snout, to cells that pick up olfactory information. How the ragged-tooth got its name is no mystery. Slender teeth aren't great for chewing, but many rows of needle-like teeth allow the shark to grab firmly on to small fish and other prey, which it swallows whole. As a tooth breaks off, its replacement is never far behind – one 'raggie' can replace up to 30,000 teeth in its lifetime. Though this super-set of chompers is ferocious in appearance, these are generally passive sharks and pose little threat to divers. The blood-rich gills of the raggie contain an impressive network of tiny blood vessels that help the shark breathe underwater. When water passes over the gills, this system of fine capillaries absorbs the available oxygen so it can be transported around the body. In relation to body size, fish have more muscle than any other vertebrate. A cross-section of the shark's muscle reveals the myomeres, blocks of skeletal muscle tissue that are layered on top of each other. Each myomere is separated from the next by a layer of connective tissue, seen here as light stripes. As the muscle blocks on one side of the animal contract, the blocks on the other side relax. This push-pull system is a great way to generate quick acceleration through the water. 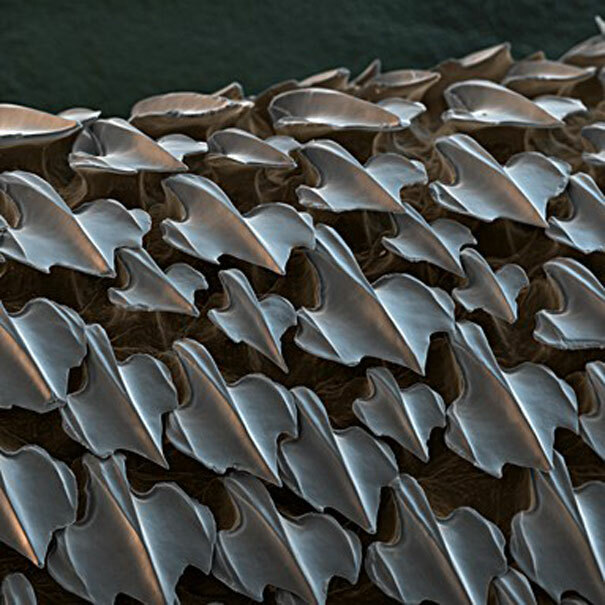 If you've ever heard that shark skin feels like sandpaper, here’s why: the skin of a shark is covered in tiny plate-like structures known as dermal denticles. Like teeth, each denticle is covered in hard enamel, which offers protection and helps reduce drag on the shark. The structures are packed tightly together with their tips facing backwards. This gives the skin a sandpaper-like feel when stroked from back to front, but allows water to pass freely over the shark as the animal glides seamlessly through the water. Female ragged-tooth sharks can produce as many as 20,000 eggs, which are enclosed in the uterus (top). But for most of these would-be baby sharks, life is short. Baby raggies practice some serious sibling-on-sibling cannibalism. During the nine-month gestation, the first embryos to develop teeth will consume the remaining unfertilised eggs, as well as any other developing embryos. After gestation, the mother will give birth to just two victorious pups. What you're looking at is oil oozing out of the shark's liver, the largest organ in the body. This precious oil, which acts as the shark's energy storage and provides buoyancy, has long been used by humans in cosmetics, vaccines and as a nutritional supplement. An inexperienced investigator on a mission to find the shark's heart may have a hard time ... because this beautiful organ is actually located in the head region of the animal. Unlike human hearts, which have four chambers, a shark's heart has only two. The blood is pumped by the heart through the arteries to the capillaries we saw in the gills, where the blood is oxygenated. Interestingly, sharks have low blood pressure, but that pressure increases with muscular effort. This means that in order to maintain blood circulation, many sharks have to move continuously. Though shark hearts are relatively small in comparison to body size, this aorta still dwarfs a human finger.